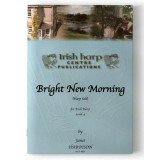 For Harp at Level 4Leap of Faith was composed in 2002 when the composer decided to move home to the ..
for Harp at Level 3 The Autumn Waltz was composed on August 14th, 2002 for the composer’s a..
for Harp at Level 4 Composed in 1995 celebrating peace in Northern Ireland BRIGHT NEW MORNING&nb.. Original Piece - Harp Solo for Harp at Level 4 An original piece composed for Derek ..
for Harp at Level 4 On 11th November, 1997, Mary McAleese was inaugurat.. Original Piece - Harp Solo for harp at Level 4 Journey into Exile and Suan..
for Harp at Level 3 A solo version of the choral setting of the Kyrie in the large-scale ..
for Harp at Level 4 Love’s Torment (or as it was originally titled ‘Love’s Comfort..
for Harp at Level 3 This was composed in 1986 for Dr Basil Wilson, Archaeologist and o..
for Harp at Level 4 Eleanor O Connor, Mo Mháithrín was composed for and dedicate..
for Harp at Level 3A combination of 2 original reels with a play on both words real-reel swe..
for Harp at Level 2 Síle was composed in 1988 for Sheila Campbell, an adult student an..
for Harp at Level 3 Tribute to O'Neill was composed in 1985 for the Festival In..
for Harp at Level 4 Yellow man is a sticky yellow honeycomb sweet made traditionally by ..
Easter Suite (inc. Easter Snow, Lily White)Harp SoloLevel 4A suite of 5 short pieces around th..
St. John’s MarchHarp SoloLevel 3 - MarchA solemn march based on a 1-1- 4-5 ostinato composed for the.. 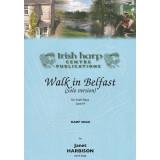 Walk in Belfast - (Solo version)Harp SoloLevel 4 - AirComposed by Janet one Sunday morning whe..